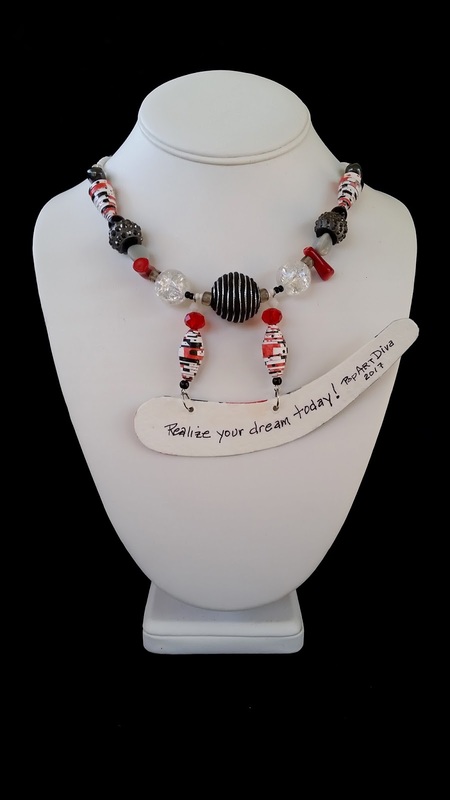 "REALIZE YOUR DREAM TODAY" is a contemporary paper statement necklace that features a paper pendant with an original, abstract watercolor painting in black, red and gray set against the natural white tones of the watercolor paper. The crescent shaped painted pendant is dropped from the beaded choker with two dangles of paper and glass beads. 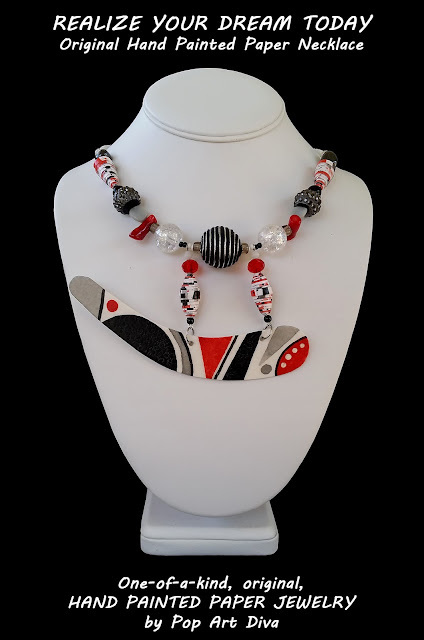 The choker features a black fabric and silver cord wrapped center bead flanked by matching specialty rhinestone studded beads, coral beads, glass beads in coordinating colors of red, black, gray, clear and white plus two more of my hand painted watercolor paper beads. This necklace comes with a 3-3/8" NECKLACE EXTENDER INCLUDED and FREE SHIPPING. An original, one-of-a-kind, hand painted, abstract watercolor painting “pendant” on 400 pound D'Arches archival watercolor paper. This makes the main and largest feature of the necklace extremely lightweight. The paper pendant measures 5-3/8" wide by 1" high. The pendant is 1/32" thick. Signed and dated with the inspirational message "Realize Your Dreams Today" on the back. Fabric, coral, rhinestone, glass and hand painted paper beads, nickle free findings. 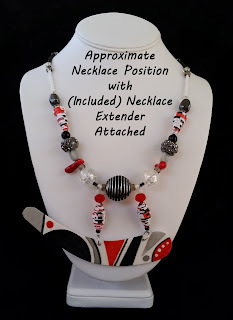 Necklace length including clasp is 19-1/2". With 3-3/8" extender attached necklace length is 22-7/8". 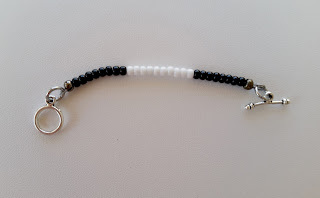 Necklace clasp is a toggle. 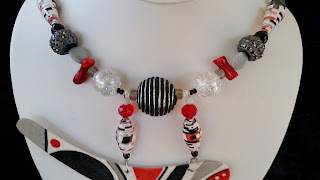 Primary colors are red, black, grey and white.